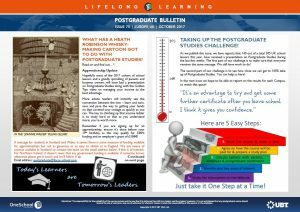 The October version of the Postgraduate Bulletin is now online, and can be downloaded by clicking on the icon below. One of the key messages that caught our eye this month is that today’s learners are tomorrow’s leaders! This statement surely inspires any would-be Postgraduate student who hasn’t quite yet taken action and enrolled on a course! Is that you? Also included with this month’s issue is an updated directory of Campus Postgraduate Coordinators with contact details, in case you need any support at a local level. Use them – they’re there for you! ← September Bulletin now online!